Every year hundreds of 'orphans' are handed into the centre. Most of these animals are not true orphans so it is essential that you only pick up a youngster when it is clearly in danger or in need of help. Picking a baby animal up, especially a mammal can decrease its chance of survival as the parents may abandon it. Many wild animals will leave young un-attended while they search for food including deer and foxes. *Excessive vocalisation - most mammals will call out when they are hungry. We recommend observing the youngster and if the parent does not show then to give us a call were we can advise you further. Vocalisation may also be heard when the animal is in distress. It is important to assess the situation before intervening. Wandering young - if a young animal such as a badger or fox cub is found wandering on its own something may be wrong. it can indicate something has happened to the parents or it has got lost. 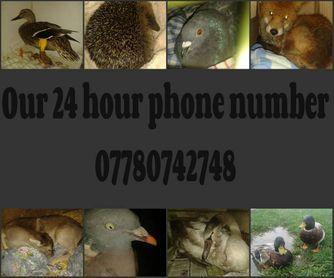 If you have found or seen an injured or unwell animal we advise you ring the emergency numbers asap. If the animal is a fox, badger or deer we recommend you stay with or observe the animal but no attempt should be made to restrain it. An injured animal will be very frightened and will fight tooth and claw to avoid confrontation with humans. If the animal you have found is a bird, small mammal, reptile or fish we advise you put it into a secure box or container or in the case of fish, in a bucket of water from the capture site (unless a dirty pool) and then ring us or your nearest centre. An ill or injured animal will usually be in some form of shock and this can cause the animal to be hypothermic. Where possible keep the animal warm using a heat pad or water bottle filled with hot water and keep away from domestic pets such as dogs and cats. *if the bleeding is minimal we recommend putting the animal into a secure dark box and covering it with a towel. Most animals will go dormant and calm down therefore the heart rate will decrease. *If the bleeding is heavy or arterial we recommend applying pressure using banadge if possible or rags if no bandages are available. In the caas of arterial bleeding especially on legs etc you can use a scarf, bandage or rope to stem blood flow by creating a tornique above the wound. Seek assistance asap. *Dehydration maybe characterised by excessive thirst, sunken eyes, skin tenting and collapse. Animals can be offered water from a syringe or small dish. Do not leave water in with a very poorly animal. it may drown if it is weak..
Any hedgehog or badger out in the day may be in trouble. 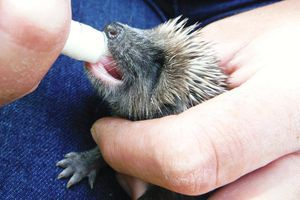 Any hedgehog under 600g at the end of October/November should be handed into a hedgehog carer for overwintering.